Few people like to admit it, but it is a fact that most car owners have experienced being locked out of their car at least once in their lifetime. Some have even experienced losing their car keys. Sometimes keys can possibly get jammed in the ignition and cannot be retrieved. All these can be a horrendous experience especially when there’s an emergency. One of the best ways to quickly get your hands on a new car key is to use the services of professional automotive locksmiths. They are very experienced in dealing with all types of car keys that are commonly used today. Most automotive companies nowadays have been adding new technology to their vehicles. This includes the car keys to make their vehicles more secure. There was a time when only mechanically cut keys were issued by the car manufacturers. However, things have changed a lot in the past few decades. New technology has emerged that offers greater security to vehicle owners. Many new vehicles sold today come with keys that have embedded chips and transponders that are extremely difficult to duplicate. In this article, we will take a look at the variety of car keys that are prevalent in the market today. This is the most common type of car key out there. It is cut mechanically and uses ridges as well as cuts on one side. With this component, it can be inserted in the ignition from one side only. This kind of key can be easily made with machines designed to cut metal. Most of the professional locksmiths will use a die punch or a special machine to cut this type of car key. This car key is much more secured compared to the mechanically cut ones. It is also known as internally cut or sidewinders key. This is because lasers are used to cut the key in a very precise manner. Lasers create grooves on both sides of the key shank that are difficult to replicate. This type of car key is comparatively difficult to duplicate and also much more expensive. This is due to the specialised machinery required for cutting the key. It can be inserted in the ignition from either side. This type of car keys consists of a microchip that is inserted in the key handle. This microchip helps in preventing any kind of key fraud. It also serves the purpose of ignition security. 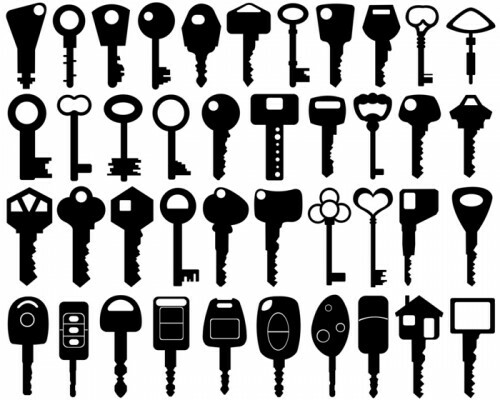 It is extremely difficult to duplicate this kind of key without the specialised equipment. However, with the right transponder key systems, an experienced automotive locksmith can duplicate such a key on the spot. This is a recently developed type of car key that is not very widely used. This is called a smart key as it allows the car owner to use the key remotely from a reasonable distance. This type of key allows remote opening and closing of doors. Some of these keys also allow starting the car remotely. This kind of car key has a vehicle anti-theft system. This system comes in a form of a resistor chip which is added on the blade that provides additional security. This resistor chip has 1 of the 15 values. The resistor chip on this car key is different from the computer microchip in the transponder keys. It is very difficult to replicate the resistor chip in this type of car key. As the name suggests, this key allows the car owner to handle the key to a valet for parking and retrieving the car. This type of car key is modified to only allow operation of ignition and door locks. One cannot easily open the trunk as well as glove boxes with the use of this key. Usually, this car key is issued alongside a transponder or smart key. When you have lost or broken your car key, you really do not need to worry about it. There are a lot of professional and affordable automotive locksmith services in Melbourne that can help you out. They are expert personnel who can help you in getting a new car key without waiting too long. Going to your car dealer is much of a hassle. You will not only have to wait longer to get a new key, but you will also need to pay a lot of money. Relying on one of the experienced and skilled automotive locksmith services in Melbourne is therefore a great option for people who have lost or broken their car keys. This is especially true if you want to get a new car key in no time.